"My father is not a bum. He isn't, he isn't, he isn't. I'll find my father, I'll find him. Then she'll see how fine he is." One of these days someone is going to write a film about an orphan who finds himself in a really cool home with great foster parents; a kid that is really popular at school and thinks his life couldn't be better. Surely there has to be at least one orphan who doesn't move in with wicked and strict old people bent on making the poor kid's life a living hell. Well, this isn't that film. Vladimir Grammatikov's 1987 Mio min Mio (aka Mio In The Land Of Faraway) is another in a long line of films based on the poor, repressed orphan who seeks solace in his imaginings. Based on Astrid Lindgren's (Pippi Longstocking) children's novel Mio, My Son, and sporting a soundtrack by ABBA's Bjorn Ulviaes and Benny Andersson, this Swedish/Norwegian/Soviet Union production is presented here in its English dubbed version. Young Bosse (Nick Pickard) is an orphan living with his tyrannical, adoptive relatives and is picked on by his schoolmates. His only friends are Benke (Christian Bale - Empire Of The Sun) and Benke's father (Stig Engström). He dreams of a day when his own father will return, an idea that his witch of a aunt dispels with haste while ranting about the procedures he must endure when he finally arrives home from school. When sent to his room for coming home late and having his cap ruined by the neighborhood bullies, Bosse decides to go out looking for his father. As he passes the confectionery, Mrs. Lundin (Linn Stokke), the shopkeeper, who has a soft spot for Mio, gives the boy an apple, along with a very important and magic postcard, addressed to the king of the Land of Faraway. When a great spirit appears and carries the young boy away on his beard, his adventures in the fantastic have only just begun. 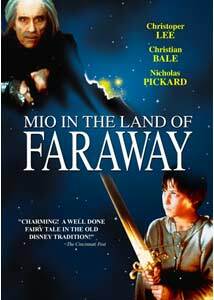 Arriving at the mystical Green Meadow Island, Bosse soon learns that he is actually a prince, whose name here is Mio, and that his father (Timothy Bottoms) is the king. He also meets up with Yum Yum, his friend from the former world, Benke. Alas, a great sadness is upon the land, as the evil knight Kato (Christopher Lee) has stolen away many of the children, and turned them into birds through his powers of dark magic. Through a tale told by a (you guessed it) magic wishing well, Mio is destined to save the children by confronting the dark knight in the land outside. He embarks with Yum Yum on a perilous journey into the dark world. Can he save the children or will he too secumb to their fate? Despite some really scenic Scottish, Swiss and Crimean locations, nice costuming and cinematography, I found this film to be fairly lacking in redeeming qualities. I suspect part of the issue is the dub which, while not terrible, may be imparting a bit too much cutesy-ness for my liking. Kids may find this enjoyable, but despite my affection for well done children's films, this one just doesn't cut it for me. The acting and plot are forced, and the outcome, while inevitable, doesn't leave much room for the possibility of failure. I wouldn't say this is a write-off, just not one I'd recommend in the genre. Image Transfer Review: Anchor Bay presents Mio in an anamorphic 1.85:1 transfer. The image is extremely clean, with only minor compression issues in a couple of places. Colors are lush and striking during the first half, then are carried by earthy browns and greys during the latter portions of the film, with only the darkest scenes suffering from the grain structure, which is otherwise naturally rendered. No signs of edge enhancement to ruin the purposefully soft focus sequences. Another impressive transfer. Audio Transfer Review: Dolby surround is presented with no anomalies in the transfer. Dialogue is clear and easily discernable. The sound field is well utilzed both in width and depth, with ambient sounds and the film's score. Surround activity is not abused, but well-placed and effective. No complaints here, other than the lack of the original language track. Extras Review: The film's widecreen trailer is presented in an anamorphic transfer. A poster replica is included on the heavy cardboard insert card. Nice visuals, okay special effects and a decent score don't make up for an otherwise mediocre film. I'm sure some will enjoy it for its fantasy premise, but I found it a little too blasé for my taste. It wouldn't be too hard to find better children's escapist fantasies out there. I wouldn't trust Timothy Bottoms' character with my kids, and Christopher Lee just isn't convincing as the bad guy. Pretty average, although Anchor Bay's presentation is well done.